A new pigeon species, the Zealandian Dove, which is related to the extinct dodo, has been identified at the Central Otago fossil site near St Bathans on the South Island of New Zealand by researchers from New Zealand and Australia. Today, New Zealand only has two species of native pigeons—the New Zealand Pigeon and the closely-related Chatham Island Pigeon. In a paper published in Paleontología Y Evolución de las Aves researchers from Canterbury Museum, Flinders University, Museum of New Zealand Te Papa Tongarewa, and UNSW Sydney, describe the new species from the pigeon and dove family, Columbidae, which lived in the South Island some 16–19 million years ago. The Zealandian Dove, Deliaphaps zealandiensis, is named after the continent of Zealandia and has been identified from a few fossil bones of the wing and pectoral girdle found at St Bathans over the last 16 years. One of the wing bones is very similar to members of a group that includes the Tooth-billed Pigeon (found only in Samoa), the crowned pigeons of New Guinea, and the Nicobar Pigeon (South East Asia). The latter is the closest living relative of the extinct dodo and solitaire from the Mascarene Islands in the Indian Ocean. "Fossils recovered from the St Bathans site now number in the thousands and together document a time of great biodiversity in New Zealand's history," says team member and UNSW scientist Professor Sue Hand. "For many of New Zealand's very distinctive bird lineages, such as moa and kiwi, the St Bathans fossils provide their oldest and sometimes first deep time records. Discovery of the Zealandian Dove and its evident links to the dodo are fascinating additions to the unfolding picture of New Zealand's prehistoric menagerie," she says. Study lead author Dr. Vanesa De Pietri from Canterbury Museum says: "Based on the St Bathans fossils, we think that the Zealandian Dove is part of this Indo-Pacific group. It is probably most similar to the Nicobar Pigeon and is therefore a close relative (or at least a cousin) of the famous dodo. "The Zealandian Dove is the first record of this group found in the southern part of the nearly submerged land mass known as Zealandia." The Zealandian Dove is the second pigeon found at the St Bathans fossil site. "Some years ago we described the St Bathans Pigeon, which we believe is a relative of New Zealand's two living native pigeons and to the Australian Topknot Pigeon," says Dr. Paul Scofield from Canterbury Museum. 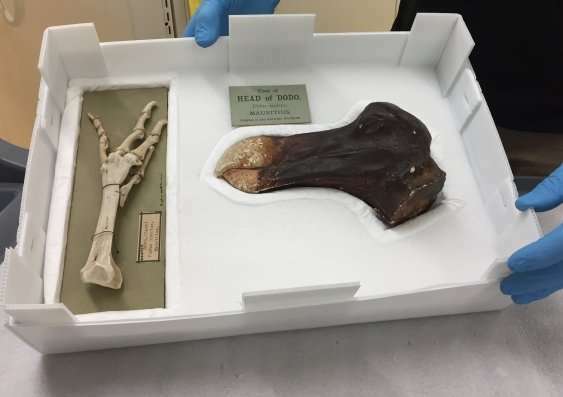 "We have now also found a leg bone that we can attribute to this species. As a result we can now confirm that the St Bathans Pigeon is also closely related to Indonesian and Melanesian mountain pigeons. It was an early offshoot within that particular group." Dr. Trevor Worthy of Flinders University adds: "Some 19 to 16 million years ago, the diversity of endemic pigeons in New Zealand included at least two distinct co-existing lineages in the southern part of Zealandia taking advantage of the more diverse fruiting trees then available. "Pigeon fossils are rare in the St Bathans fauna and are outnumbered by about 30 to one by parrots, which perhaps reflects the relative abundance of these tree-dwelling birds in the St Bathans Fauna. Many small parrots form large flocks, whereas pigeons typically live in only small groups, so perhaps these traits typified the early Miocene parrots and pigeons in Zealandia." Alan Tennyson of Te Papa says: "The disappearance of these pigeons from New Zealand's fauna was likely linked to the marked climatic cooling that took place between 14.2 and 13.8 million years ago. "Until then, New Zealand's subtropical flora and fauna was very diverse with fruit-bearing trees such as laurels. This loss of floral diversity certainly had an impact on fruit and seed-eating birds, and may have been responsible for the subsequent loss in pigeon diversity in New Zealand." Are Australia's native pigeons sitting ducks?